Being quality oriented organization, we are offering Rubber Car Mat of outstanding quality to the clients. As a quality driven enterprise, we are engaged in providing a high quality range of Car Floor Rubber Mat. We are one of the most well-distinguished companies in the market that are into offering Car Rubber Mat. Rubber Car Mats are offered in variety of designs, shapes, sizes and colors. 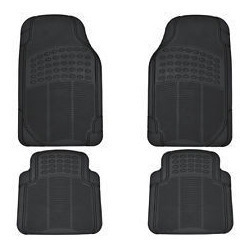 Our assortment of Car Mats are available at most competitive prices. Our company is capable of providing our customers with Rubber Car Mat, that are best suited for protecting the floor of the car from wear & tear. Our Rubber car mat are widely appreciated by the clients due to their elegant designs, styles, perfect fitting and anti-slip backing. 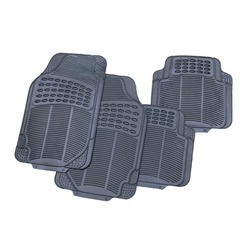 Our organization has gained immense appreciation for offering supreme quality Car Rubber Mats. We bring to our customers Good Year Car Floor Mats with an innovatively raised rib and the patented raised rib design that is exclusively present in this model and in our company only.The Kraco Floor Mats KR 5704 licensed from GOOD YEAR we offer have the following featrures.